Full day immersion into Mid Century Mod-ness. September 18th, 2010 is going to devour your Mid Century Modern loving soul. So get your calendars and mark 'em. Indiana Landmarks is bringing the Mod-ness. You'll get a full day of lectures from people so worth listening to. A discussion panel with real MCM architects from back in the day. The noshing of lunch. And the cherry on top: A walking tour of an entire MCM neighborhood with access to three Mid Century Modern homes. This awesomeness is dubbed the Mid Century Modern Experience. Editor of Modernism Magazine, Sandy McLendon: "American Idyll: Reviving Suburbia"
Author of Atomic Indy [dot] Com (that's me! ): "Corn Fed Modern"
Founding partner of Axis Architecture, Drew White: "How to respect original modern design while meeting the needs of contemporary life." Preservationist and Atomic Ranch contributor, Connie Zeigler: "Avriel Shull and Thornhurst." 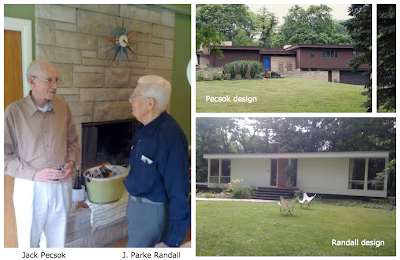 Panel discussion with original Indy Mid Century Modern architects, J. Parke Randall and Jack Pecsok. 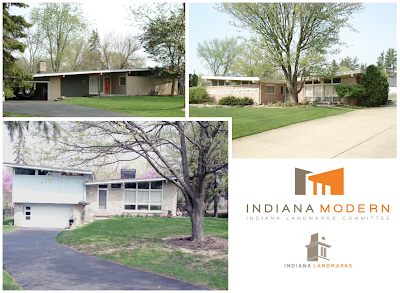 They'll be sharing what it was like to build modern architecture in Mid Century Indianapolis. To add some juxtaposition, we'll throw young architect, Wil Marquez in the mix. I'll be your humble host and will rely on your questions. So make 'em good. And that's just the morning. Whew. Breathe. We'll eat lunch. We'll talk. We'll laugh. We'll consume sustenance. Both literally and figuratively. Then we'll head over to the famed Thornhurst Addition designed by Avriel Shull. Here Connie Zeigler leads us on a walking tour of the neighborhood and takes us into three homes. Connie's got the credentials, having written Thornhurst's recently approved nomination to the National Register of Historic Places. Tip of the fedora to Connie. Sampling of homes from Thornhurst. We may not get access to these exact three. 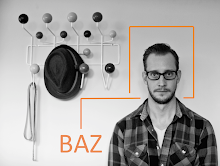 WHAT: Mid Century Modern Experience - Home tour and lectures. WHEN: Saturday, Sept. 18, 9 a.m.-5 p.m.
WHERE: King of Glory Lutheran Church, 2201 E. 106th St., and Thornhurst neighborhood, Carmel, Indiana. WHO: Sponsored by Indiana Landmarks. COST: $40 for members. $45 for non-members. (Become a member). HOW: To make reservations, call 317-639-4534 or email Suzanne Stanis. Yes. It costs some coin. But. It goes to the preservation of Indiana's modernism (we're not getting paid to present). So come have fun, and save something with a flat roof somewhere in an Indiana corn field. You'll be glad you did. Looking forward to it! Here's a home that will be on the tour. Photo by Avriel. Sounds fab. I will be getting my modern fix at the modernism show in San Francisco that weekend - and going to some of the stores you reviewed in your blog. Have fun!